Fuji Xerox DocuPrint CP505 d dan P505 d has high accuracy printing, suitable for government and enterprises. Fuji Xerox P285 dw dan M285 z aiming at Small-Medium Business who needs high-quality printing that is reliable and efficient. 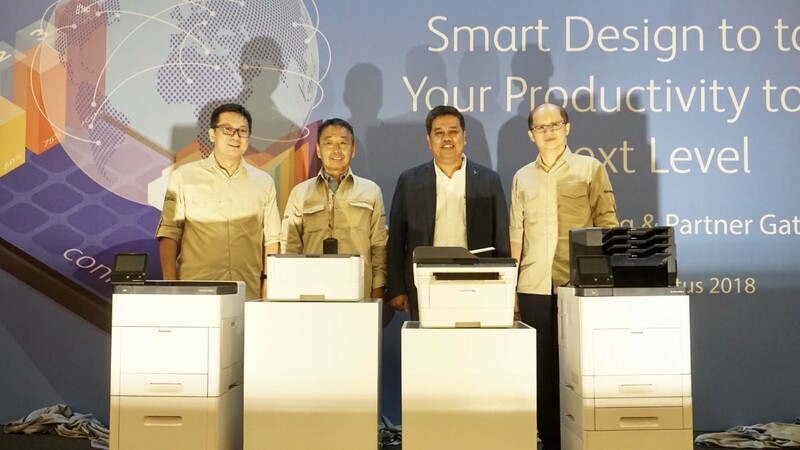 Jakarta, 3 August 2018 – Astragraphia Document Solution launches color printer Fuji Xerox DocuPrint CP505 d and monochrome printer DocuPrint P505 d, DocuPrint P285 dw, and DocuPrint M285 z in Indonesia. These printers are suitable for small-medium business, government, an enterprise that needs high-quality printing in large volume but still reliable and economical. The new models could support business productivity through faster printing speeds, higher output resolution, and enhanced connectivity that enables both networked and mobile printing. Modern enterprises consistently face multiple challenges in project management, with the top three being: tight delivery schedules, quality issues, and high costs. Project stakeholders are thus required to ensure maximum productivity at every level, in order to achieve desired results without compromising on quality. Designed for easy-to-use experience and personalization, DocuPrint CP505 d, DocuPrint P505 d, DocuPrint P285 dw, and DocuPrint M285 z cater to all those needs. “Document and administration needs may look simple but actually it takes quite a big budget of the company. Astragraphia realizes that this issue needs to be tackled so we try to help the corporates to push the profit-generating through efficiency and managing document in the company” said Mangara Pangaribuan, Director of PT Astra Graphia Tbk. “Through these new series of Fuji Xerox, we hope that our customers – from Small-Medium Business, Government, and Enterprise sector – could run their business efficiently and productive so we all could contribute to the nation and also the community around us, be it from the economical-side and also the resource,” he added. DocuPrint CP505 d in an A4 printer that could deliver high volume print jobs using fast simplex and duplex speeds, capable of offering high simplex speeds of up to 43/43 pages per minute (ppm) black/color and duplex up to 41/41 ppm black/color respectively for A4 printing. This DocuPrint model incorporates the newly-developed three roller paper feed system, or ‘tri-roll’ system, which increases duplex print speed by up to 88 percent from simplex print speeds. This is achieved by feeding an extra sheet of paper into the printer whilst the first two sheets cross over the tri-roll system. This advancement in operations enables customers to improve productivity and reduce production costs at the same time. DocuPrint CP505 d equipped with the Current Confinement Self-Scanning Light Emitting Device (CCSLED) and Image Registration Control Technology (IReCT) which allows for a higher resolution output at 1200 x 2400 dot per inch (dpi) quality. The DocuPrint P505 d on the other hand, produces documents at simplex speeds of up to 63 ppm – making it suitable for printing large volumes of monochrome documents, quickly. DocuPrint P505 d is equipped with Current Confinement Self-Scanning Light Emitting Device (CCSLED) dan Image Registration Control Technology (IReCT) that is able to produce a resolution output of up to 1200 x 1200 dpi. With an improved registration accuracy and ultra-precision image reproduction, DocuPrint P505 d is well-suited for jobs requiring fine line printing, such as barcodes and quick response codes. 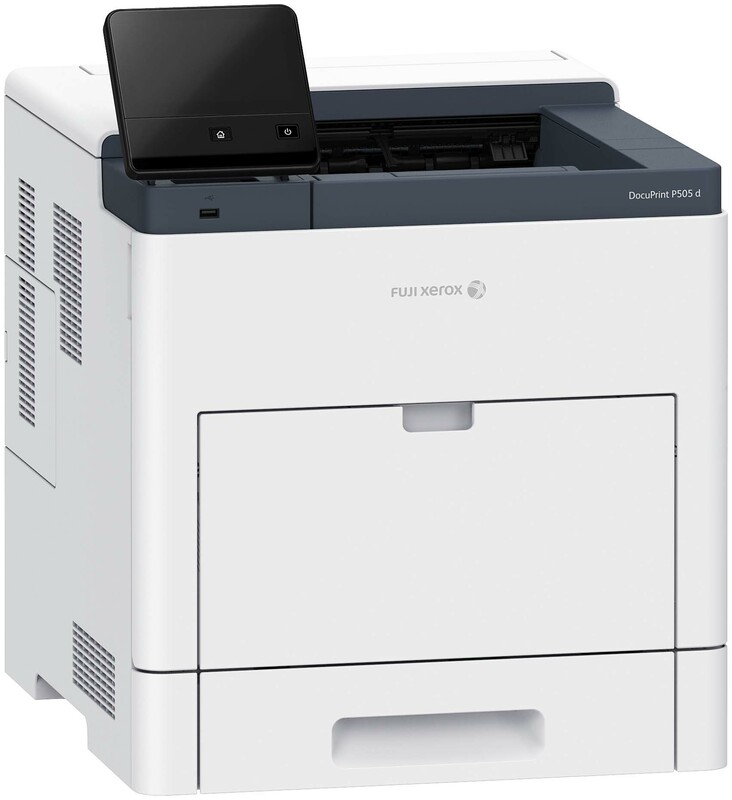 Fuji Xerox DocuPrint P285 dw (Monochrome A4 Printer) and M285 z (Monochrome Multifunction A4 Printer) is the right solution for Small-Medium Business that needs high-quality printing, fast, and efficient with flexible connectivity in a compact size. With 34ppm speed and 1200x1200 dpi resolution, bringing the highest quality, faster printing, and the fastest first-page-out-time in its class. DocuPrint M285 z is equipped with Single Pass Duplex Automatic Document Feeder (SPDADF), that has a 50-sheet feeder for a scan in one time, reducing the processing and waiting time. Cost wise, this printer is designed to maintain the overall operational budget low, with choices of 3K or 4.5K toner. For enterprises that are looking for faster cable connectivity, Fuji Xerox’s new series of printers can help simplify access to information with data connectivity options such as Gigabit Ethernet and USB 3.0 for networked printing solutions. The new printers are also equipped with mobile print connectivity features such as Apple Airprint©, Google Cloud Print©, Mopria© Alliance Certification, Near Field Communication (NFC) and optional Wi-Fi Direct – enabling customers to conveniently print from any device. To ensure the efficient and smooth management of printer inventory, usage, and costs, the new series of printers are also equipped with both CentreWare Internet Services and Xerox Standard Accounting. CentreWare Internet Services helps the administrator find and manage the fleet of Fuji Xerox printers within the network, while Xerox Standard Accounting enables the administrator to manage users and control costs. The series also includes a Super EA-Eco Toner which contains a new polyester resin that effects the viscosity of the toner when changing temperature. This enables the Super EA-Eco Toner to achieve a lower fusing temperature of 10-15 degree Celsius, reducing power consumption by up to 20 percent, and reducing CO2 emissions by up to 35 percent. Astragraphia Document Solution is supported by sales network and after-sales service points that have reached up to 514 cities in Indonesia, supported by 86 certified System Analysts and 300 reliable and trained Customer Engineers to ensure the productivity of document solutions on Fuji Xerox MFD machines the customer can run well. Customers can directly contact Halo Astragraphia at 1500345 or visit the Documentsolution.com website. PT Astra Graphia Tbk, one of the subsidiaries Astra International known as the leader in the field of document solution in Indonesia again proves its existence and quality in serving consumers.